We tend to think of volcanoes as these explosive and tempermental forces of nature; it's not easy to predict when they will erupt, and when they do, it is almost impossible to stop them from destroying whatever is in their path. It's quite surprising, and interesting, when we learn about cases where the actual volcanic eruption itself has given us a better understanding of what it wiped out. Usually eruption products from volcanoes tend to wipe out everything in its path. This includes lahar flows, lava flows, and pyroclastic flows. Pyroclastic flows tend to be the most deadly, reaching maximum speeds of 700 km/hr depending on its composition. Lahar flows tend to be centralised along routes of high water accumulation, such as along rivers and its banks. Lava flows are usually the slowest, and have no preference of landscape, simply travelling from a high point to a low point along the gradient. Things trapped in lava flows tend to burn, especially organic material. When this organic material is a tree, the wood burns and turns to charcoal. Sometimes, because of the tree being encased in a layer of lava, it protects the charcoal from further being destroyed. The charcoal is then preserved in the lava flow for a long time. So why are we so interested in this charcoal? Well, charcoal is dateable by radiocarbon dating. This means the charcoal can be collected and dated using C-14 dating, to find the age of when it was formed (when it was turned to carbon). Using this information, we can then deduce when the lava flow was active and formed this charcoal, thus telling us when the volcano erupted (and formed the lava flow). Video above: Example of lava flow burning organic material. What is burnt forms charcoal which can be trapped and preserved by subsequent lava flows. Case in point: Xitle volcano. Located in the southwestern part of Mexico City, Xitle is a monogenetic volcano, having only erupted during one period, between 245-315 AD.The lava flow that was extruded during this eruption travelled north and engulfed the city that was located there, CuiCuilco. 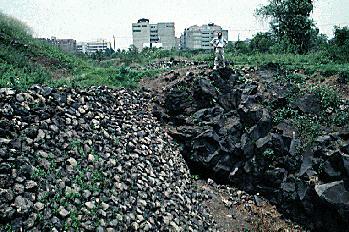 The resulting lava field that is still present there today is known as the Pedregal de San Angel lava field. The extent of the lava flow field is around 80 square km. So how do we know what happened? What is left of the remains of Cuicuilco city is buried and preserved in the lava flow. But one pyramid, a circular pyramid showing designs of an agricultural system, was preserved, with the lava flow flowing around it. 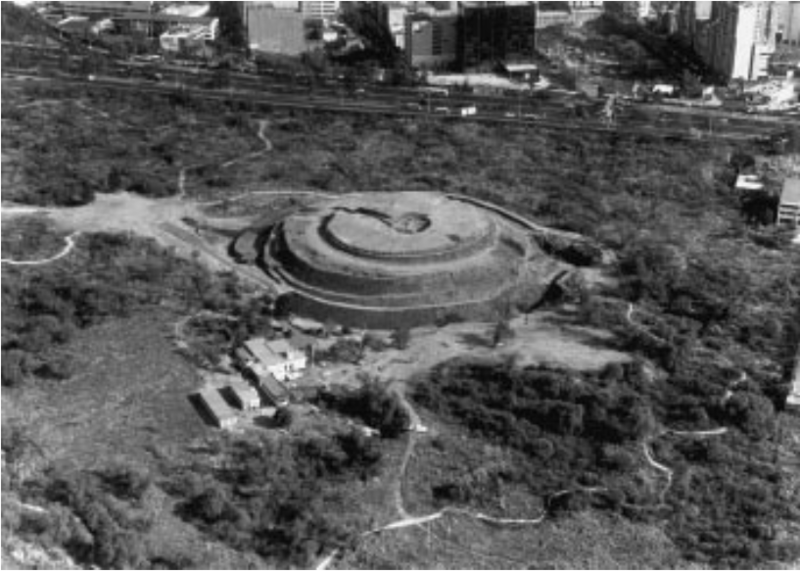 In the 1990s, archeological digs at and around this site brought about a better understanding of the location and discovery of the buried city of Cuicuilco. What was the most important find was charcoal samples found under the layer of lava. Figure above: The remaining pyramid of Cuicuilco, surrounded by the Xintle lava flow. In the background you can see the approaching urbanisation of Mexico City. (Picture from Siebe, 2000). Several research groups gathered many charcoal samples to date with radiocarbon dating. The resulting age was that the charcoal formed between 245-315 AD (1670 +/- 35 years Before Present). Because of this known carbon age, scientists have deduced that the lava flow that destroyed Cuicuilco was formed during this time, and this was when Xitle was active. This age also helped identify the time period of when civilisation in Cuicuilco and the surrounding region was focused in that area. According to archeological classification, the Cuicuilco city and the people living there was intially thought to have been during the end of the Pre Classic Period. However, because of these newer ages (because of the lava flow), we now know that the civilisation was active during the Classic Period of Mesoamerican archeology. As a result of this new age, groups studying the population movements in Mexico now have a better understanding of civilisation in Cuicuilco. Cuicuilco is considered one of the earliest metropolitan cities of the New World, and during this period of 245-315 AD, there was a decline in the population, which was previously not well understood. There are still other factors contributing to the decline of the civilisation during that time, but one of the biggest contributors was the volcanic eruption of Xitle. 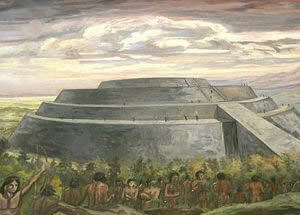 Figure (left): Mural depicting the Cuicuilco civilisation in the past (Photo from http://www.revistabuenviaje.com). 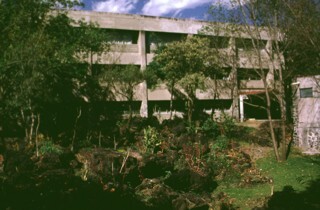 Figure (right): The National University of Mexico, built on the Xitle lava flow (Photo by Lee Siebert, 1998). It is sad to report that much of the Cuicuilco pyramid has been destroyed, as urbanisation in the area has bloomed and flourished across the region as Mexico City has grown. Studies of this lava flow still continue to this day, however, with focus on young volcanic eruptions and efforts to date the lava flow directly. The National University of Mexico also has a particular affinity to the Xitle lava flow, as part of the campus is built on the lava flow! For more information of the volcanic activity in the region around Xitle, click here. For more information on dating lava flows using charcoal, click here.